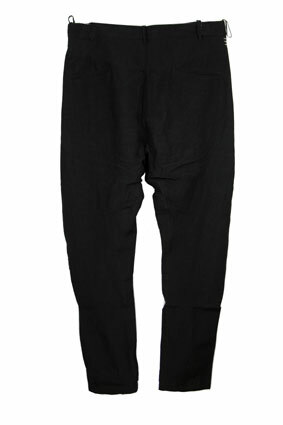 Masnada black linen trousers,the fabric is superb. Banana leg style, but not overly so. Fly is button fastening with beautiful black buttons. Belt loops. Side pockets. Heavy duty metal staple detail at each side, below waistband, three staples each side. 2 pockets at the rear. Trousers are unfinished on length and can be left that way id preferred. Seams have wide heavy stitch detail on front panels. Excellent trousers highly recommended.